As the new year approaches, it’s a useful time to look at what we can all look forward to in the new year. I mean, it’s pretty arbitrary in general… except when you’re talking about accounting or CLE requirements. But we do it anyway, because it’s interesting. If you haven’t heard of Meerkat, Periscope, or Blab, then you’re in a bit of trouble when it comes to social media marketing in 2016. It hasn’t even been a year since Meerkat started the live-stream revolution in social media, and it’s exploded since then. For marketers in general, live streaming is the next level of engagement and communication. It’s not hard to see why – live streaming increases transparency and authenticity, while being new and fresh. Some lawyers and legal services providers have already started to use live streaming in interesting ways, but the most effective in my opinion is the interview. Have someone talk to you about a major issue and broadcast it live! It’s even possible to engage others in a discussion (be careful about the ethics part!) or have a live-streamed roundtable among experts that others can tune in to. However, most live streaming services don’t save your video, so be sure you download it before it’s deleted! As lawyers, I’m sure you’ve already gotten a little bit annoyed at the update you see on LinkedIn every time one of your connections publishes something. Well, what you’re getting annoyed at is just one of the ways that social media networks are attempting to change the way content is published on the internet. 2016 promises to be the year they truly push that plan into high gear. LinkedIn Publisher, as a platform, allows you to share information with your network. It’s like having a blog, but within LinkedIn itself. Why? So that LinkedIn keeps you on its platform, which is critical for a certain stat they sell to advertisers: Time on Site. The longer you stay within the ecosystem of a social media network, the more valuable their advertising spots are. LinkedIn isn’t alone. Facebook, with its new Instant Articles and Twitter with Moments are both getting into the publishing game. More importantly, they’re all giving much higher priority to posts that keep visitors on their site, rather than redirecting to your law firm’s website or blog. While this may not be great news for bloggers (like me), it creates some opportunities as well. If you’re using social media to market your law firm, then you know that the most important metrics involve engagement. Well, you’re not going to have any engagement if nobody sees your posts. Writing long-form posts (also known as “microblogging”) or publishing directly through the publishing platforms the social media networks offer promises to get your information more exposure than just sharing a link to your website. At a time when success on social media is becoming more and more expensive, finding one way to increase your exposure for free isn’t something you should pass up! Yep, you had to know it was coming. So many law firms spent time and money making sure that their websites had every SEO advantage that could be purchased. Yet, at the same time, they looked at social media with disdain (or outright disgust). Well, now Google has decided to punish you for all those little SEO tricks you purchased, while at the same time, increasing the value of social engagement in its algorithm. Remember, your website is essentially evaluated in two categories: relevance and authority. The more social media posts you share on a certain topic, the more relevant your site will be for that topic. The more engagement your posts receive, particularly on Facebook and Google+, the higher your site’s authority ranking will be. The message is simple: social media marketing is necessary if your website’s search rank is important. Use social media. Well, that’s not really accurate. Use social media correctly. If your law firm creates new content for your website, such as a blog or other updates, share them on social media as part of an established social media strategy. Encourage your employees to share that content. Find ways to get it in front of more people that matter. This might be the biggest buzzkill on this list, and I’m not happy to say it either. The social media networks began to realize that their users are valuable, and that they’re not really interested in being completely bombarded with ads. The combination = profit. Facebook took the lead, a couple years back, by changing the way information appears in their users news feed. Even if someone has “Liked” your company page, the only way you’re going to get something on your page to be seen on Facebook is to pay. Now, other social networks are adopting Facebook’s system. The recently launched Twitter Moments and Snapchat Stories now seek to do a lot of what the Facebook News Feed does – give their users a “best of” selection from their networks. In order to get information to your followers, you’re going to have to pay. But if you’re paying for something, you need to also understand your results. Well, the social media networks have figured out how to make money on this information too! Yep, if you want access to the analytics from Facebook, Twitter, LinkedIn, or others, expect to pay. Ok, it’s hard to define the advantages of paying for social media advertising, until you realize that most of your competitors don’t do it. Most law firms that promote themselves on social media still think they can get all they need from their regular posts. They can’t, and you know it. Knowledge is power, so use it. Additionally, the analytics information available for purchase is likely to be relatively inexpensive now. Get in the game early before the cost goes up, and make use of the analytics data to improve your social media marketing in ways other law firms won’t be able to do. If you’re not a little bit tired of hearing about how “visual” posts are some kind of trend in social media, you’re not paying attention. Visual is almost always better, and has been for a while. It’s not a trend, so much as a fact. On the other hand, the potential benefit of visuals in social media may be about to take a quantum leap forward. Why? Image recognition and analysis. Imagine if you could search for an image or a type of image based on the image itself. (Currently, such searches are based on the tags included in the post, which can be manipulated.) Your search results would include images that actually included what you searched for. Guess what – it’s pretty much here. So in reality, it’s not that visuals haven’t been important for a while, it’s that they’re about to become much more important. Which also means that the visuals you share need to be both appropriate for the topic of your post and as high quality as possible. A low-quality visual simply won’t stand out. Since the importance of visuals in social media marketing isn’t really new, the best way for your law firm to take advantage of its increased importance is to allocate your resources appropriately. You know that creating high-quality, topic-appropriate social media images will take time, so plan accordingly. Image creation and adaptation cannot be an afterthought. It’s really time to stop thinking of social media marketing as something other than marketing. While there are different rules, concepts, and ways to measure success than in other types of marketing, it’s time to make sure your social media marketing is producing results. That means figuring out where social media fits in your overall marketing strategy, and setting clear, measurable goals. Fortunately, recent mergers in the social media analytics world will help you do that. But it’s likely going to require a bit of a paradigm shift. You will need to give up on the basic “vanity metrics” we have relied on for years – followers, page likes, and “trust” just don’t pay the bills. Now that social media marketing demands a larger and larger chunk of your law firm’s advertising budget, you need to be able to show what works. One of the key results of investigating what works, you actually find out what works! By actually taking the time to put a social media strategy in place and within your overall marketing strategy, you’ll learn what it’s optimal role is. Furthermore, you’ll learn how other digital marketing tools, such as well-constructed landing pages and automated email systems, can turn social media leads into actual clients for your law firm. Most of the rest of us, however, have done best to stay away from cameras. Face it, we’re just not good at it. That’s too bad, because video has now become a HUGE part of social media marketing. And the social media networks have noticed. Know how many videos are streamed on Facebook every day? 4 billion. And part of the reason for that: the video ads they show automatically start playing when you see them! Yep, while it means their numbers may be a bit inflated, it also means that your video will start playing even if the user doesn’t click on it. Moreover, Facebook provides a treasure trove of data to advertisers who share their video directly to Facebook. Twitter, Snapchat, Instagram, they’re all creating great platforms for videos. More importantly, they’re giving significant advantages to anyone who puts the video directly on their network. That means you can’t just share a YouTube video anymore and expect big results. Use these tips for creating a high-quality video, then share it directly to Facebook. 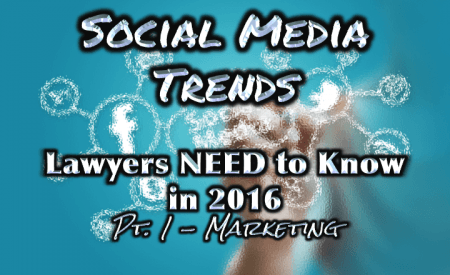 Law firms need to recognize that video marketing isn’t just talking directly to a camera. There are a number of ways you can promote your law firm using video, including how-to videos, bios of your law firm’s employees, or client testimonials. What is important is creating videos that someone will actually stop and watch. What good is it that your video plays automatically if everyone that sees it immediately scrolls down?